Ofcom is looking for graduates to join our graduate scheme. If you’re looking to put your degree into practice in a vital and dynamic sector and help to make a difference for millions of consumers, take a look at our job site for more information about how to apply. Ofcom is at the cutting edge of modern communications - from broadcasting on TV and radio, to telecoms and how we communicate with each other, to new wireless technologies. Our graduates play a key role in all of these areas. Join us, and you can get involved from the start. Here is what some of our current and past graduates had to say about working in Ofcom. Are you interested in learning how we apply economics in some of the most vital and dynamic sectors of the UK economy? Each summer Ofcom runs an internship scheme aimed at economics students who have an interest in Ofcom’s activities and in gaining an insight into the career of an applied economist in the modern commercial world. The successful interns will work with us for 6 to 8 weeks during Summer 2019 (July and August). The roles are available in both our London and Edinburgh offices and the salary is at the level of the London Living Wage. 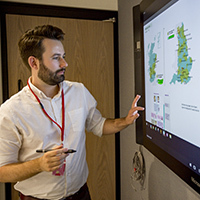 Within Ofcom we work in multi-disciplinary teams, so you will have the chance to work with experienced economists, lawyers and policy makers and see how economics is applied in real world scenarios. In past years, interns have helped us on projects such as: the BBC, spectrum auctions (for 4G and 5G), research into various media advertising markets, and the nature of competition in mobile and broadband services. Applications for Summer 2019 have now closed. With field engineers based around the UK, the field operations team ensures that the radio spectrum is kept free of interference. Ofcom has recruited a number of apprentices to join the field operations team and work alongside the field engineers while studying for their Higher National Certificate. Apprentices who join the Ofcom apprenticeship scheme undertake a two-year programme during which time they become an integral part of the field operations team. Apprentices spend time in the field being mentored by an experienced engineer, and deal with real day-to-day issues, ranging from small-scale local domestic TV interference through to problems with the communications systems of the emergency services and mobile phone networks.